Instead of the typical tamarind or kamias, this version of sinigang used unripe mangoes as its sourting agent for a mild tang. 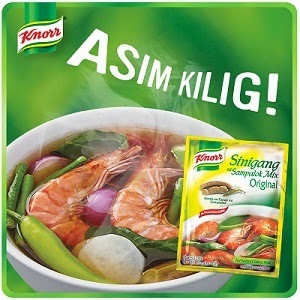 Make your sinigang extra sour and extra delicious with the addition of mango! Try this quick and simple recipe for an enjoyable meal. 1. Saute ribs in oil, add water, onion, tomatoes, and mango and bring to boil. 2. Add Knorr Pork Cubes, reduce heat to simmer and add chili. 3. Once pork is fork tender, add beans and cabbage and simmer until cooked.